In Trunks, Proboscides & Makaracetus, I argued the extinct whale Makaracetus bidens probably didn’t have a “trunk” or “proboscis”, contra Gingerich et al. (2005). For one thing, an overhaul of terminology resulted in ‘trunk’ no longer referring to a nasal appendage, ‘proboscis’ being restricted to tubular nasal/lip structures capable of grasping food, and all other elongate nasal structures being termed ‘prorhiscis’ (Milewski & Dierenfeld 2013). Makaracetus certainly had over-developed facial features compared to its cetaceous relatives, but it didn’t appear any more likely to have a “trunk” than, say, a camel. 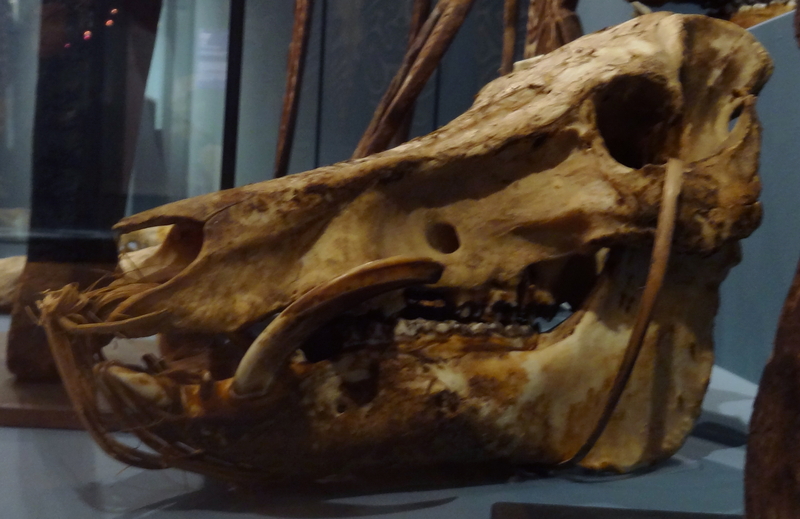 Boar skull, courtesy of Markus Bühler. One feature of Makaracetus I didn’t discuss in the last round were its maxillary fossae, which Gingerich et al. noted were also present in pigs. This feature is plainly visible on the boar skull above — it’s the virtual trench running from the orbits down the snout. 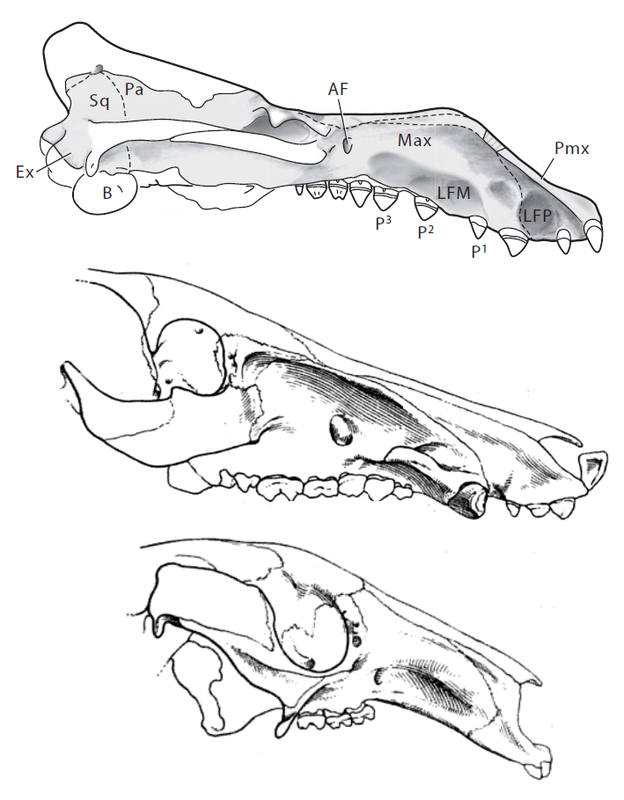 These fossae provide attachment for the maxillolabialis superior and inferior, which are responsible for moving the protruding snout (Gregory 1920). What’s interesting is that pigs almost fit the definition of having a proboscis. Pigs can apparently grasp food items with both their nose and lip musculature, but fall short of the definition since only the disc is mobile (Milewski & Dierenfeld 2013). Does this mean Makaracetus may have had some sort of proboscis after all? Probably not. It’s notable that one trait shared by proboscides owners is directional olfaction (Milewski & Dierenfeld 2013), which seems like an unlikely trait for a cetacean to evolve, considering they lack the ability to smell underwater. Furthermore, pigs don’t have exclusive rights to maxillary fossae. 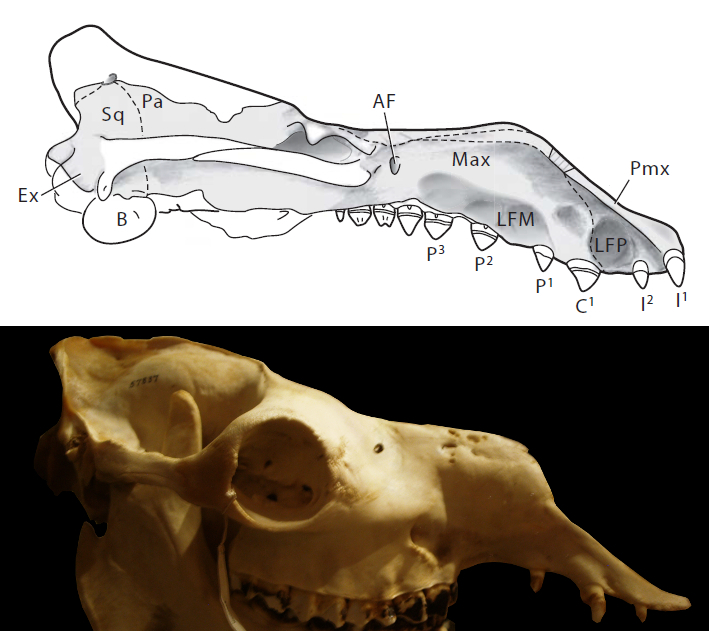 Kangaroo maxillary fossae bear a surprising resemblance to those of Makaracetus — they’re similar in extent, only present anterior of the antorbital foramen, and are on the lower half of the rostrum. 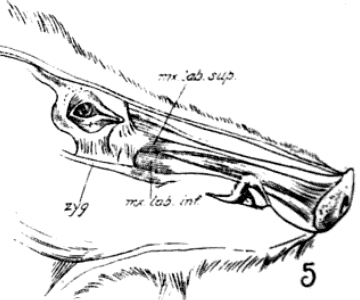 Unlike pigs, the maxillary fossae of kangaroos provide an origin for part of the buccinator muscle (Gregory 1920). The fossae are also present in baboons, where I suspect they have something to do with this display. Maxillary fossae also appear to be present in llamas but apparently not camels, for some reason. Considering the apparently variable functions of maxillary fossae and the additional premaxillary fossae of even more mysterious purpose, I’d agree with Gingerich et al.’s interpretation of “hypertrophied facial muscles” for Makaracetus and hesitate to speculate much further. So if the nose of Makaracetus didn’t bear a proboscis or prorhiscis, what did it do? Perhaps the expanded nasal vestibule was merely a side effect of the snout warping into a down-turned shape. Another parallel could be found in Gray Seals, which have nasals retracted to a similar degree as Makaracetus and enlarged noses which function as displays (Miller & Boness 1979); however more specimens will be required to conclude that the trait was sexually dimorphic. Milewski & Dierenfeld (2013) hypothesized that the enlarged nose of Moose may act as a buoy to counterbalance to forelimbs when foraging underwater, a trait which could be beneficial to the apparently benthic-feeding Makaracetus. However, Makaracetus appears to have a much smaller nasal chamber than Moose, so the potential benefits could have been minimal. 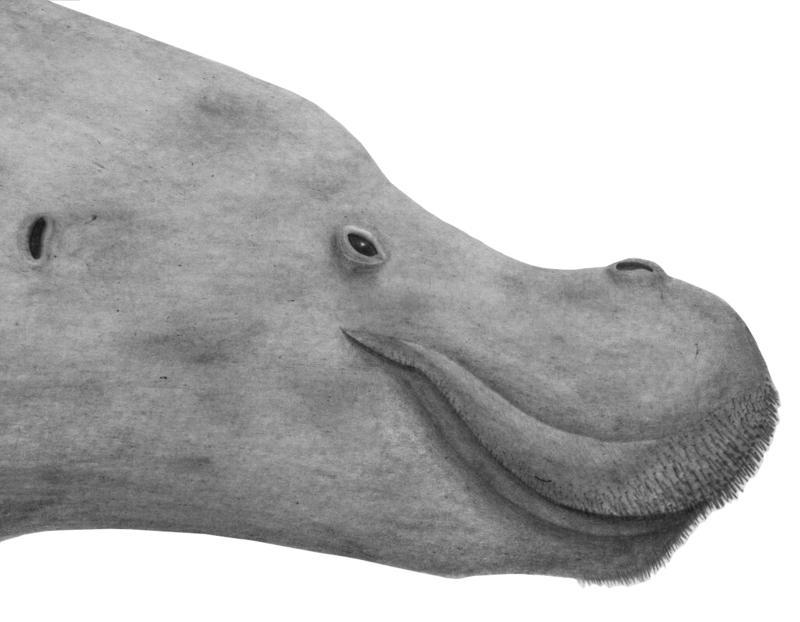 I reconstructed Makaracetus as a Hippo/Manatee/Walrus-thing up top, but I suspect my endeavors were far too conservative. Makaracetus was a beast without obvious parallels and its true appearance can probably never be known. Still, there’s no reason to go slapping a “trunk” on strange-looking skulls, and I hope Milewski & Dierenfeld (2013) will get the attention it deserves and open minds to the myriad other possibilities of big, weird noses. This entry was posted in Cetaceans, Fossils, Soft Tissue and tagged Archaeocetes, Cetaceans, Comparative Biology, Fossils, Makaracetus bidens, Marine Mammals, Proboscis, Prorhiscis on January 28, 2013 by Cameron. The terms ‘trunk’ and ‘proboscis’ have been applied to a heterogeneous array of bits danging off vertebrate faces such as the bulbous nose of male Proboscis Monkeys, the pendulous resonating chamber of male Elephant Seals, the hydrostatic facial tentacle of proper elephants, and even the chins of Elephantnose Fish. Milewski & Dierenfeld (2013) argue the terminology has become “dysfunctionally vague” and in need of a massive overhaul. The authors trash the term ‘trunk’ as it is vague and redundant (being a synonym for ‘torso’) and lacks precedence over ‘proboscis’, which was originally applied to elephants and roughly translates as ‘forager’. Due to this etymology and the extreme morphology exhibited by elephants, the term ‘proboscis’ was redefined to be a tubular extension of nasal and lip musculature capable of grasping food (Milewski & Dierenfeld 2013). The only extant non-Proboscideans to fit this definition are tapirs, and while numerous extinct mammals have been interpreted with proboscides (Palorchestes, Cadurcodon, Brachycrus, Macrauchenia, Pyrotherium) only Astrapotherium has a good case for having a proboscis under this new definition, since it doesn’t appear to have been capable of feeding itself otherwise. 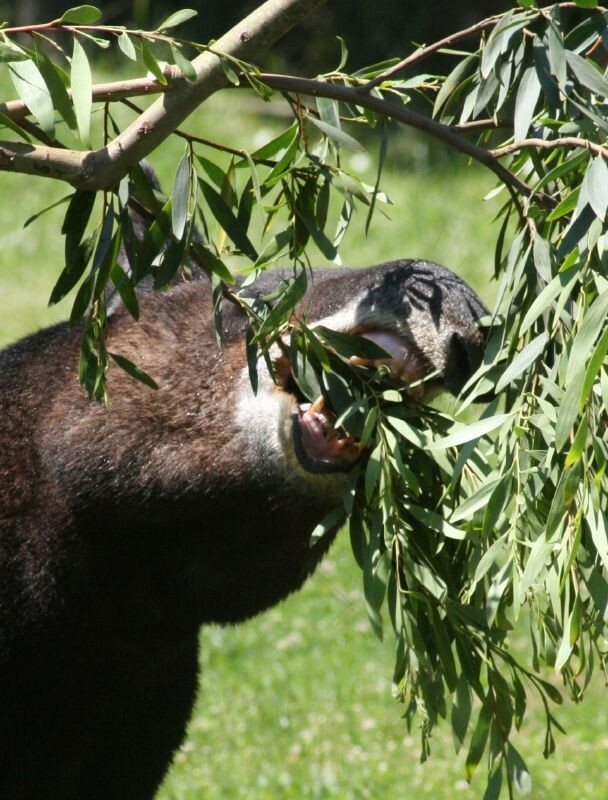 This Mountain Tapir demonstrates that if narial tubes are wrapping around food, it’s a proboscis. From Wikipedia Commons. As for other nasal structures that are incapable of grasping food, those have now been termed ‘prorhiscis’. These, uh, ‘prorhiscides’ (?) have disparate functions ranging from a directional sense of smell in Elephant-Shrews, dust filtration in Saiga, thermoregulation and water conservation in Dik-Diks, amplification of roars in Elephant Seals, and possibly acting as a buoy for diving Moose (Milewski & Dierenfeld 2012). There are other weird structures formerly labeled ‘proboscis’ in fish, but that’s really a story for a different time. 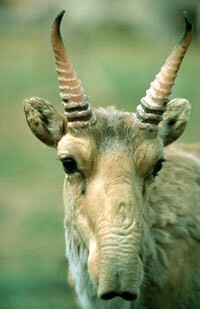 The snout of a Saiga rivals that of Tapirs in length, but does not incorporate the lips or grasp food, and is thus a prorhiscis and not proboscis. From Wikipedia Commons. Gingerich et al. (2005) interpreted the extinct whale Makaracetus as having a “trunk” or “short, muscular proboscis” but confusingly referenced tapirs, manatees and walruses as “imperfect models”. Were they proposing an elephantine proboscis, prehensile lips, or something in between? This is a great example of how the now-archaic terminology was “dysfunctionally vague” and in light of Milewski and Dierenfeld’s efforts, it’s time for a reassessment. 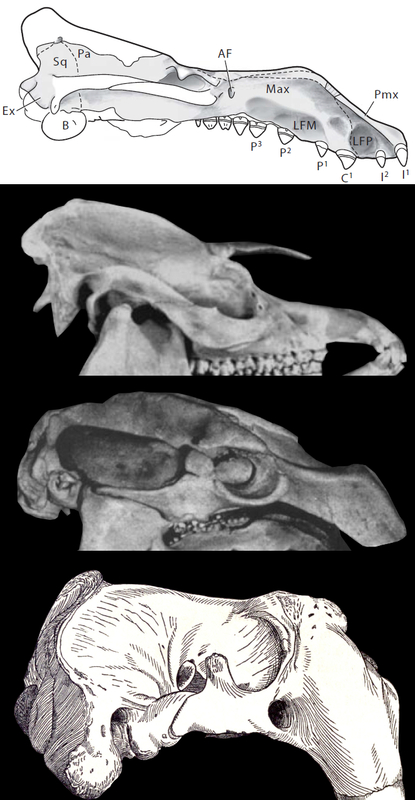 Makaracetus is classified as a protocetid and appears fairly similar to species such as Artiocetus (above), although with four pronounced differences: a nasal vestibule extending to the end of the snout, a downward-deflected rostrum with two rather than three pairs of incisors, “extraordinary” fossae (labeled LFM, LFP above) suggesting massive facial muscles, and enlarged antorbital canals (labeled AF above) indicating increased blood supply to the end of the snout (Gingerich et al. 2005). Clearly something odd was growing on the face of Makaracetus, but without living protocetids, it’s a bit hard to tell just what. I’m not even certain if a Tapir-style proboscis can be distinguished from a prorhiscis without live specimens, so, unfortunately, it appears there’s just no way of knowing things for certain. That won’t stop me from rampantly speculating. Imperfect models indeed. Gingerich et al. (2005) compared Makaracetus and Tapirs on the basis of expanded nasal vestibules, however, the nasals of Makaracetus are only around half as retracted. Makaracetus and Manatees were compared on the basis of being aquatic and having down-turned rostrums, which Gingerich et al. suggested to be an indicator of benthic feeding. Walruses were suggested as an ecological model, namely as a species that uses facial muscles to prey on bivalves, despite having some very different anatomy. The proposed ecology seems reasonable — although it requires better-known teeth to confirm — but as for what was happening with the nose of Makaracetus, there are some more interesting models. Dromedary from Harvard Museum of Natural History. Superficially, Makaracetus looks kinda camel-y. The rostra of the two species, while differing considerably in depth, appear to be deflected downward at a similar relative place and to a similar degree. Camels have one less pair of incisors than Makaracetus and, oddly, the placements of the remaining incisor pair, canine, and first premolar are comparable. The antorbital foramen (“AF”) of the camel appears to be larger than that of Makaracetus. There are of course several pronounced differences between the two, namely, the fossae in Makaracetus (LFM, LFP) do not appear to have equivalents in camels and, perhaps as a result of these structures, Makaracetus has a rostrum that looks spoon-like when viewed above and camels don’t. Makaracetus and camels undoubtedly had enlarged noses for very different reasons, but this comparison makes a proboscis or even prorhiscis seem unlikely in the whale. But I’m not quite done with Makaracetus yet, I haven’t even talked about pigs and moose! That will have to wait for a followup to this increasingly out-of-control article. This entry was posted in Cetaceans, Fossils, Soft Tissue and tagged Archaeocetes, Camels, Cetaceans, Comparative Biology, Elephants, Fossils, Manatees, Proboscideans, Proboscis, Prorhiscis, Sirenians, Tapirs, Walruses on January 21, 2013 by Cameron.